At the stroke of midnight on January 1, 2012, the list of words allowed in Scrabble changed. In this issue of Word Buff Stuff! I'd like to chat about the new words, help you learn them, and tell you where you can (and can't!) play them. <--- If you don't want to read the whole newsletter, just click on one of the shortcuts there on the left. In short, this change is for people who play Scrabble to the 'World English' Scrabble lexicon, usually referred to as CSW (short for Collins Scrabble Words) or SOWPODS (an outdated but frequently used acronym). 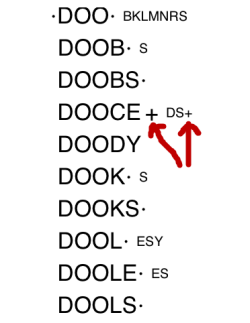 The Scrabble lexicons used in North America (often referred to as OSPD or TWL or OWL or OTaCWL) are not affected by this change. Confused already? Scrabble is owned by Hasbro in North America and by Mattel throughout the rest of the world. Unfortunately, each has its own official Scrabble dictionary. The change I'm talking about here refers to the 'rest of the world' dictionary overseen by the World English-speaking Scrabble Association (WESPA) on behalf of Mattel. As Collins is commissioned with publishing the dictionary, the official name of the lexicon is Collins Scrabble Words, or CSW for short. The new version of this lexicon is known as CSW12, which replaces CSW07, with the version numbers indicating the years in which they were officially instated. Still Confused? Read this earlier newsletter. Just like any dictionary, a Scrabble dictionary needs to be updated from time to time to reflect changes in the English language and to allow errors to be corrected. If it wasn't, you wouldn't be allowed to play modern everyday words like EMAIL and BLOG! Although there is no rule about the frequency of dictionary updates, Scrabble dictionaries tend to be updated every five years or so. And so it is quite timely that CSW07 has now been replaced by CSW12. The task of scouring all the source dictionaries and identifying which words should and shouldn't be allowed, based on the guidelines provided by the game's creator more than half a century ago, is a long and arduous one. If you're interested in some background about this process you might like to read this interview with Darryl Francis (the head of the Collins/WESPA dictionary committee) in which I asked him a long list of questions about the ins and outs of this tricky business. But this newsletter isn't about the making of the new dictionary, it's about getting started with the new dictionary. In particular, I'd like to show you how you can familiarize yourself with all the new words and start playing with them. The exact cover title is Collins Official Scrabble Words. It is the 3rd Edition published on 5 May 2011. What Are All The New Scrabble Words? As handy as it is to have a complete tome sitting on your bookshelf explicitly listing all allowable Scrabble words up to fifteen letters in length, it is not exactly an easy book to memorize. Whether you are studying words to build your vocabulary or master Scrabble, most of us find it essential to organize the words we want to learn into manageable lists. In particular, it is a good idea to have a separate list of all the new words so you can give them more attention than words you have already seen many times before. For this purpose, I've put together a list of all the new words in a simple format that I find useful, and I've made it available in the Members Area. If you come across some favorites, make sure you tell us about them in the comments area right down near the bottom of this page! Before leaving you with all these exciting new Scrabble words to munch on, I should also point out a word of warning for those of you who have a fairly good knowledge of the existing Scrabble dictionary. Namely, you will also need to unlearn a few words that were removed from the lexicon for a variety of reasons. You can get this handy list of deleted Scrabble words here. NOTE — In addition to studying lists explicitly devoted to the new words, it is also important to highlight new and deleted words when revising more comprehensive word lists. In the sections on Zyzzyva and Zarf (below) I'll show you how to do this. With around one quarter of a million words in the official Scrabble lexicon, it's only occasionally that the addition of an extra word makes a noticeable difference to the game. Years ago, such a game-changer was the two letter word QI, which almost made the dreaded Q-stick a thing of the past. Although there are no new words in CSW12 that will have the level of impact of QI, there is one little gem you'll be playing time and time again. That word is QIN; a very handy hook to QI as it turns out, which otherwise only takes an S.
Below I provide detailed instructions for updating three popular Scrabble Apps with the new international Scrabble lexicon. The first two apps, Zyzzyva and Quackle, are used by virtually all competitive Scrabble players, while the third, Zarf, is a lovely new app that appears to be on the rise. Zyzzyva — a word study and word search application that is especially designed for Scrabble players. Virtually all competitive Scrabble players use Zyzzyva and I recommend you do too. Mainly because it is fantastic. Zyzzyva is available for both desktop computers and Apple iDevices (iPhone, iPad, and iPod Touch). To keep things clear, I'll provide instructions for each of these options separately. Quackle — a free Scrabble game player and analysis tool that identifies available moves during a game and simulates options to find out which move is best. Quackle is only available in a desktop version. Zarf — a free iPhone app that lets you search for Scrabble words satisfying various criteria, adjudicate word challenges during a Scrabble game, and time-keep games being played in tournament style. The new Scrabble words will affect the first two of these functions. Make sure you have the latest version of Zyzzyva installed. To use CSW12 you should use version 2.1.6 or later. (An earlier version also supports CSW12, but has some known bugs which have since been corrected). Click OK, then OK again. If Zyzzyva prompts you to create lexicon databases, say Yes. This will take a while. At this point, Zyzzyva should be using CSW12 with its updated database. You may want to restart Zyzzyva just in case. NOTE — I use Zyzzyva on the iPhone, so my instructions and screenshots are based on that device. If you're using Zyzzyva on an iPad or an iPod Touch, the instructions should still be exactly the same, but I can't personally vouch for it. Also, the Zyzzyva iDevice app comes in two flavors: a free version and a paid version. Only the paid version has all the word study features relevant to the present discussion, so that's the one I'll describe below. Open Zyzzyva and tap the Settings icon in the lower right-hand corner of the screen. 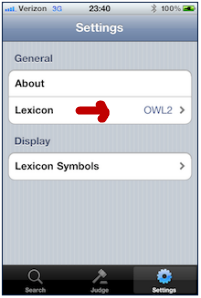 In the General area (at the top of the Settings screen) tap Lexicon to get a list of installed word lists. You should see ODS5, OSPD4, OWL2, and WWF. Tap Add Custom Lexicon... to open the Add Lexicon screen. 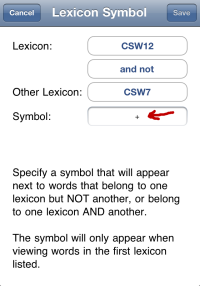 If you would like all your generated word lists to clearly indicate which words are new to CSW12, return to the Settings screen and tap Lexicon Symbols in the Search panel to open the Lexicon Symbols screen. Select CSW12 in the "Lexicon" field and CSW7 in the "Other Lexicon" field. (Leave the middle box as 'and not'; you can change it to an 'and' for other purposes, but it won't make sense for the task we're doing!). Enter a "Symbol" to indicate additions (I use a '+' sign) and then tap Save to activate the new setting. Do a test search to generate a word list from CSW12 and confirm that the symbol you specified is displayed next to all newly added words. Note that the symbol is not only added to new words in a list, but is also added to any hooks that form newly added words. Very handy! If you have any more questions about Zyzzyva (either the Desktop or iDevice version), you can join the Zyzzyva Users list. I'm on this list and in my experience questions get answered promptly and thoroughly. Make sure you have the very latest version of Quackle installed on your computer. You can download the latest version here. Earlier versions will not support CSW12! By the way, don't be fooled (like I was) into clicking that Settings item on the main menu bar at the top of the screen! It's the Settings tab you're looking for. If you're a bit of a pedant like me, you might like to make absolutely sure that everything is AOK. Click Generate Word list from the shortcuts bar (under the main menu). When Quackle's word list generator pops up, enter QIN in the text box and click the blue search button. 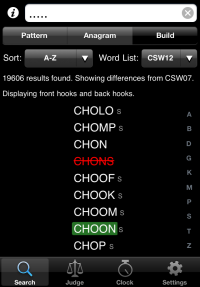 If the results area displays the new CSW12 word QIN, you're good to go! NOTE — Just as I was finishing off this newsletter my iPhone self-destructed! As a result, I don't have as many Zarf screenshots as I would have liked. Sorry about that. Hopefully my instructions are still clear enough for you to follow. When you first open Zarf you'll see a Word List area with a dropdown list next to it in the upper right area of the screen. Tap the Settings icon in the lower right-hand corner of the screen to open the Settings screen. In the Settings screen tap Word Lists to open the Word Lists screen. In the Word Lists screen tap Download New Word List... to open the New Word List screen. 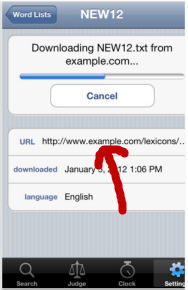 In the New Word List screen you will see a field called "URL", followed by the prefix 'http://'. This is where you enter the Web location of the word list you'd like to use. Select English as the "Language" (if you don't remember to do this, the app will complain later) and then tap Go (in the lower left corner of the screen). If you've entered the URL correctly, you'll get a 'Downloading CSW12 from...' message while the system locates and loads the CSW12 lexicon (it only a took a few seconds on my phone). 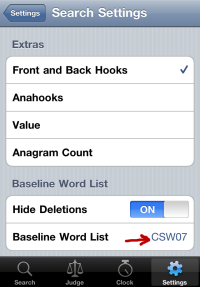 Navigate back to the Search screen of the app and check that the "Word List" dropdown contains the option CSW12. Select CSW12 and tap Done. As a final check, tap the Judge icon at the bottom of the screen to open the Word Judge screen. 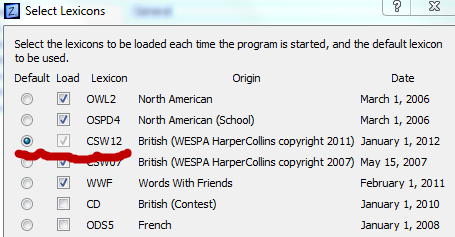 Select CSW12 from the "Word List" dropdown. In the "Enter Disputed Words" field, type in a CSW12-only word (e.g. QIN or CHOON). 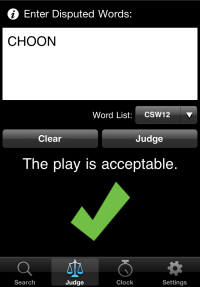 Tap Judge and check that the word is allowed. Nice huh? 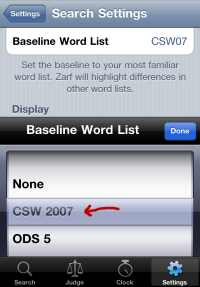 In our case we want to specify CSW07 as the baseline lexicon, so that when we generate a list of CSW12 words, the new and deleted words will appear just like in that picture above. Open the Settings screen and tap Search to display the Search Settings screen. On the Search Settings screen tap Baseline Word List and select CSW 2007 from the displayed list of lexicons. Tap Done to return to the main Search Settings screen. If you would also like to see deletions highlighted (which I recommend until you're familiar with them) toggle the "Hide Deletions" option to OFF. Internet Scrabble Club (ISC) — This popular Scrabble venue was quick to update its wordlists to include the new Collins lexicon. 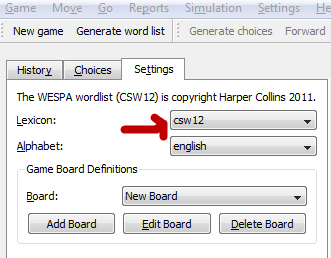 To play ISC games to the new dictionary, simply choose CSW12 when selecting from the available wordlists before starting a new game. The bad news, though, is that they have not yet updated their lexicon to CSW12. It is hard to imagine that they won't get around to doing this sometime, but despite being petitioned by many regular players they haven't got around to it yet. It is a disappointing state of affairs that an unofficial Scrabble site is ready to go with the new word list on new years eve, while we are still waiting for the owners of Scrabble who oversaw the new dictionary to allow us to play to it! If/when they implement the new word list, I'll let you know by sending out a brief update via Word Buff's Daily Digest, which will also appear as a post on Word Buff's Facebook Page, and as a Tweet on Twitter. To the best of my knowledge, there is currently no (legal) way to play Scrabble to the new Collins dictionary (or the old one for that matter) on Apple iOS devices (i.e. the iPhone, iPad, or iPod Touch). NOTE — For the technically inclined, this seems to be because GameHouse (the company Mattel licensed to build their Facebook app) have built the app using Adobe's Flash technology, which Apple famously refuses to support on its iDevices. If you found this issue of Word Buff Stuff! helpful and you're not a Word Buff member, you can join below in a few seconds. If you have anything you'd like to add or discuss in relation to this issue of Word Buff Stuff!, feel free to do so using the comments area below. P.S. If you enjoyed this article, please help build our Word Buff community by letting your friends and family know about it. A great way to do this is to share this page with others using the Twitter and Facebook buttons below the chat section. Or, if that's just not your style, please drop them an email with a link to this page. 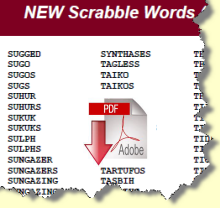 If you own a website or blog, feel free to link to this page to help your visitors get on top of the new Scrabble words. Do you have any comments you'd like to make about the new Scrabble words? Maybe a question, an opinion, or a handy tip to share? Well, This is the place to let us all know!